Liriopes are very versatile plants that can tolerate most conditions from hot dry regions to bitterly cold areas. 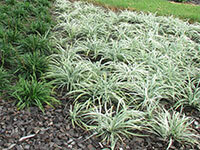 Ideal for specimen and mass plantings, they are often used in the garden as groundcovers for their evergreen foliage. Liriopes are typically frost and drought tolerant plants that suit most soil types. Ozbreed’s Liriope varieties are drought and frost tolerant, low maintenance, sun and shade tough plants well suited to all soil types. Extremely versatile, they can make a great ‘one mow per year’ lawn alternative, garden border or feature plant and can be used in mass plantings, specimen planting, or as a colour contrast plant. They work in: NSW, ACT, QLD, VIC, SA, WA, TAS & NT.